Would you jeopardize your marriage to this wonderful lady by lying about your guitar purchases? This is, of course, the missus and she knows a lot more than she lets on. contentment and that great desire to do a little better…to raise yourself up and break the bonds that tie you down. I know guys who treat their relationships with women that way but I was talking about guitars. Now, I’ll talk about women. Wives, to be specific. 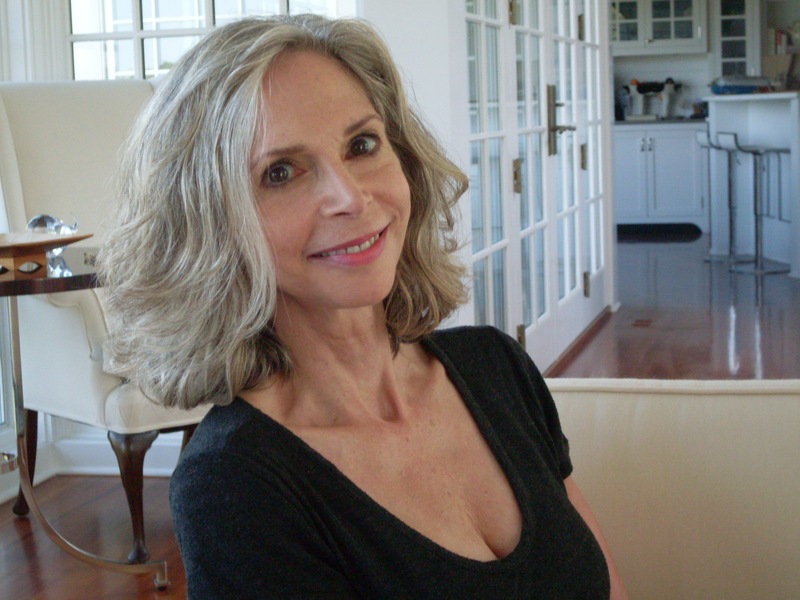 I hate to make the assumption that all my readers are men. They probably aren’t and maybe what I have to say can be applied to husbands as well as wives. 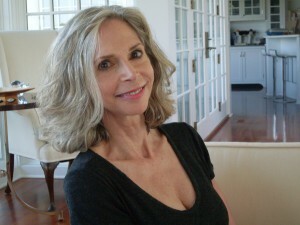 But most of my readers are men of a certain age (don’t trust anyone over 30, remember?). So, what I’m really talking about in this post (after 150 words of obfuscation) is how to keep your marriage together and keep your guitar collection too. I’m no marriage counselor but I am still on my first marriage and closing in on 30 years. I don’t live in a huge house, I don’t have a “man cave” and I keep my guitars in the spare bedroom closet or in my office. What I hear from many guitar buyers is this: “could you send the guitar to my office? I don’t want my wife to see that I’ve bought another guitar.” or how about this: “Can you write me up an invoice for $900 (for a $10,000 guitar)?” I get it. I’ve been there. As a rule, lying to your wife is a bad idea that will get you in more trouble in the long run than telling the truth in the first place. But sometimes your wife doesn’t understand that it’s often a zero sum game. I buy guitar X for $5000, I sell guitar X for $5000, I buy guitar Y for $5000. Over and over again. Sometimes you make a buck, sometimes you don’t. All your wife sees is “omigod, you spent another $5000 on a guitar?” The truth is sometimes worthless. An outright lie can be pretty destructive, so most of us resort to the “lie of omission”. And it works…sometimes. My wife doesn’t think that having half a dozen guitars is a bad thing. She knows I enjoy them but she would probably draw the line at perhaps ten. This is not about accumulating a big collection. It’s about a lot of “new” guitars showing up while others disappear. So, what can you do to keep your spouse out of your guitar “business” when giant boxes keep showing up on your front doorstep? My best gambit was not to have them show up. Have the box delivered to your office or a friends house. I always keep at least one guitar in my (non guitar business) office to play when things are slow and I rotate various guitars from home to office. So, when a new guitar is about to arrive, I would leave the house for work carrying either an empty case or a different guitar. “Which guitar is that?” she would always ask. “The red one” would usually be the answer and that was enough for her. You see, guitars aren’t described to your non guitar playing spouse as a ’59 Les Paul or a 61 dot neck 335. That’s too much information and she really, really doesn’t care. “The electric one with the pretty wood” is a good answer as well. She never asked “which red one?” Not once. So, you bring the guitar to the office or to your friends house and you swap and bring the “new” one home the same day. You can straighten out the cases later. As long as you keep the guitars to “zero sum” you’ll be OK, especially if she keeps the checkbook. Is this a prescription for marital bliss? Not necessarily but it beats the hell out of the lame excuse of “well, at least I’m not keeping a mistress…” cuz you kinda are. I should have named this one "Jarlsberg" . I've never seen a guitar with more holes in it. Refinished but pretty much original, if I recall. This, my friends, is a player. And it sounded as good as any. When you deal with such a tiny segment of the vintage market it allows you to see a snapshot of the whole market. We’ll take Les Paul Standards out of the conversation since they march to their own drummer. What I’m talking about is how to play the vintage market for maximum fun and for maximum value. The last post should have given you a pretty good idea of the market as of August 2012 but there are some general factors that will always be the same. A mint guitar will always command a premium and will always be the best investment you can make whether at the top of the market or the bottom. They fall the least during a pullback and they rise the most during an upswing. But they come with an additional price on top of the high price they already command. Call it the “mint tax”. You can read about it here. Then there is the great middle ground where you’ll find the great bulk of vintage 335s/345s and 355s. Those are the well cared for examples that have an issue or two. Changed tuners is the most common. 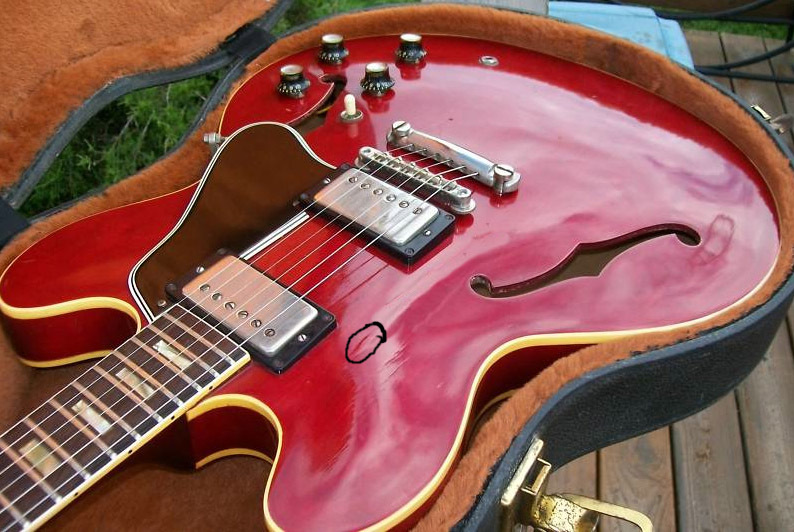 Player wear, refret, changed pot or removed pickup covers and missing stickers all fall into this category. These are guitars that can be very expensive when in great condition and, in most cases, can be played without fear of turning a mint guitar into an average one. After all, that’s how mint guitars become players. They were all mint once upon a time. They get played. Interestingly, these one or two issue guitars are the hardest to sell. The fussy collector doesn’t want it because it won’t lead the market nor will it give him (or her) the bragging rights that go with it. And don’t diminish bragging rights. Read any guitar forum and see who the “bull goose loony” is. He’s the guy with the best guitars. You know who you are and it’s a position of some status, to be sure. Only the well known pro players get more respect. Who doesn’t like a little respect from one’s peers? That takes me to the pieces that sell in a minute or less. These are the players. The guitars from the Golden Era that don’t cost much more than the current crop of Historics, special “artist” models” and “anniversary” editions that Gibson throws out there for the aficionados (and suckers depending on the model). These are guitars with unfixable issues that just won’t go away no matter how much dough you sink into your guitar. These are guitars that are refinished, have headstock repairs, Bigsby, or worse, Maestro holes, holes from coil taps, multiple tuner replacements, changed hardware and a whole host of other atrocities that render them “players”. Pssst…I’ll let you in on a secret. They sound every bit as good, in most cases, as the mint ones or the “average” ones. They sometimes sound better. This assumes that the pickups are still in it and the electronics are still more or less stock. They may sound just as good with changed pickups too, but I wouldn’t make that a blanket statement. They can be gigged without too much fear of theft or damage and you can turn around and sell them for exactly what you paid in this market. Half price or less. As a dealer, I buy up a lot of these, although I tend to stay away from headstock cracks (I hate surprises). Refins? Bring ’em on-I’ll buy every one you find. The second (or maybe third) best 335 I ever had was a refin. Removed Bigsbys? OK, so there are 6 extra holes. Close your eyes when you play-you’ll look more intense and you won’t see all the holes. I had an ES-335 that had 29 extra holes. Twenty nine!! And a refin. How do you even get that many holes in a guitar? Easy. Two different trems (10 holes), an armrest (5 holes), and backpad (8 holes) and a set of Grovers for an additional 6. That’s how. It was a 64 ES-335, I believe. It played absolutely great and sounded as good as my everyday player. I think I sold it for $5500. 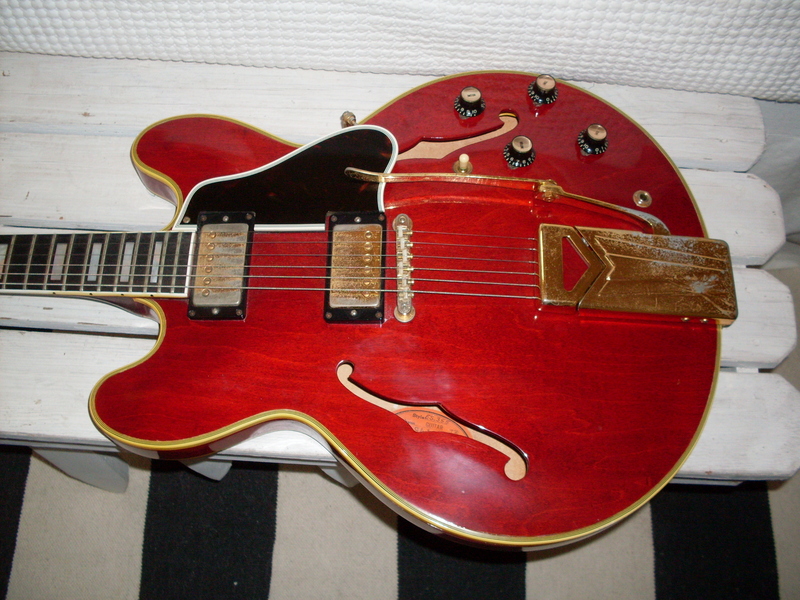 A lot of money for a guitar but not a lot for a 64 ES-335. Don't think the market has bottomed? This guitar sold for $10K-original stoptail with Grovers. So it had some wear. Still... around $10K for a stop 64? That was March 2011. I think you missed the bottom. I get asked to give my opinion on the current state of the ES market all the time and since I haven’t done it for a while, the Dog Days of Summer might be a good time to take a fresh look. Nothing-and I mean nothing-will stop the big dealers (and the Ebay sellers who copy them) from asking the big prices. A lot of the guitars that are STILL on the market were bought at or near the top and these folks are trying to recoup their investment. 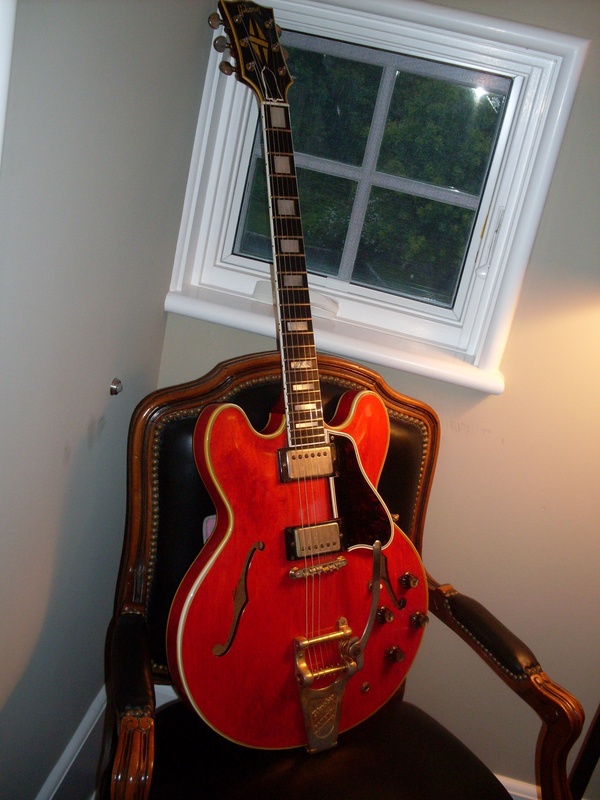 Remember to negotiate-these guys don’t expect that you’re going to pony up $28000 for a 64 ES-335. The worst they can say is no. Same as me. Don’t think for a second that you might be insulting someone with an offer that you believe is viable. They have no trouble insulting you with asking prices that are in the stratosphere (is the a Telesphere?). A lot of folks don’t like to negotiate and I understand that but the alternative is paying more than a guitar is worth or passing on a guitar you might have been able to get for a reasonable price. The reason I chose August to do this post is because this is a really slow time of year. The dealers aren’t moving as much merchandise and every business needs to generate cash. How do you do that if stuff isn’t selling for your asking price? You either lower the price or start negotiating. I lowered a bunch of prices just yesterday. While most of you know I work on a slimmer margin than many dealers, I also have no overhead (and a real job) so I can keep my prices a bit lower than many other dealers. And, since I specialize in a very narrow range of guitars, I don’t get stuck with a lot of dogs I can’t sell. We all know the bubble burst in 2008. The decline wasn’t breathtaking in its speed but was pretty substantial in the case of some guitars. SGs got killed but they had run up so far, so fast. Among the ES models, the 345s and 355s took it pretty hard dropping 30% or more between 2008 and 2011. Among 335s, the block necks got hit pretty hard and the later dots as well but the 58 and 59 dot necks held up very well. Also worth noting-the market for some ES models has come back a fair amount since last year. Not everything-Bigsby 345s and stereo 355s are still a very tough sell unless they are mint or are 59s. Bigsby/Custom Made block necks (other than 64s) have gotten whacked pretty good as well but they are back on the mend. While they were flirting with the high teens back in ’08, they dropped to $9K-$12K depending on condition. Mint stuff has held up pretty well throughout. Well played stoptail block necks bottomed out at around $10K but didn’t stay there for long. I sold at least one for $10K that was all original but pretty beat up. There are two bright spots for the seller. well, three if you count early dot necks. No issue stoptail block necks have come back nicely into the mid to high teens and up over $20K for really clean big neck 63s and 64s. The smaller neck ones lag slightly unless they have PAFs. Early dot necks are and have been strong throughout the recession. They don’t sell quickly but the prices have held on-or the sellers are holding out for better times. I’ve seen very few bargains in 58 and 59 dot necks. 61 and early 62s are a great deal right now in the low to mid teens for average examples with minor issues or wear. Finally, mono 355s are becoming much more popular and have inched up from their lows of last year. I recall a 60 selling for around $8K on Ebay that we all should have jumped on. As I wrote recently, I think they are the big bargain right now when priced in the $9K-$13K range for 59-64s with Bigsby or sideways trems. Don’t get me started on Maestros-I don’t mind them on SGs but I stay away from them on ES ‘s. Look for my post on “break angle” to find out why. If I were a buyer with a budget in the $12000 range, I’d be looking at 60-61 dot necks and 59-61 PAF equipped 355 monos. Get your negotiatin’ shoes on and go buy something before everybody gets back from vacation. We’ll look at later ones later. A 61 Bigsby dot neck for $12K? OK, it had a couple of "mystery holes" in the top but was all there with its original PAFs. This was last Spring. Modify this? Are you out of your fu...oh, hello. Below is a post about how to turn your 345 into a 335. Don't do it if you have a red 59 like this one. I’ve avoided writing this post for nearly two years because I don’t like to modify guitars but just because I don’t like it doesn’t mean you aren’t going to do it anyway and you might as well do it right. In addition to your ES-345, this also applies for rewiring a stereo ES-355. Before you do anything, ask yourself what you don’t like about your 345. Can’t deal with the stereo? Don’t like the Varitone? Think the Varitone is sucking all the tone out of your guitar? Don’t like the added weight? If the stereo aspect bothers you but you still find the Varitone useful, just have the guitar rewired for mono, keeping the Varitone in the circuit. You can eliminate a bunch of weight by removing one of the two chokes (inductors) as well. Just save the parts because the next guy might want it put back to stereo. Changing the guitar to mono isn’t simply a matter of swapping out the jack. The pickups in a stereo guitar are wired to the three way instead of the volume pots, so you have to rewire them to make the controls work as expected. Also, the pickups in a stereo guitar are out of phase with each other. Reversing phase in most situations just means reversing a wire but in this case, we’re talking about magnetic phase. Reversing the wire to one pickup won’t fix it. So here’s the bad part…You’ll have to take the cover off one of the pickups-I would suggest the neck pickup since it is easier to remove from the guitar-and flip over the magnet. To do this, you would partially unscrew the four philips screws on the bottom and also loosen the pole piece screws. That should loosen up the bobbins to the point where the magnet (and the wooden spacer) will probably drop right out. If it falls out then you have a problem because you won’t know how it was oriented to begin with and you literally won’t know which end is up. So, take your time and hold the pickup so that you can slip the magnet out. If it’s stuck, there’s usually enough sticking out that you can grab it with a pair of needlenose pliers and pull it out. Once out, flip it over-top to bottom like a pancake-not end to end. Tighten all the screws and put the cover back on and don’t forget the maple spacer-it probably fell out. If you decide you don’t like the stereo AND you don’t like the Varitone, then you may want to wire it like a 335. You could modify the harness but I would suggest not doing that because when it comes time to sell the guitar, the buyer might want a stock 345 and he won’t want yours unless the mod can be easily and cheaply reversed. The simple solution is to remove the entire harness and the chokes. They come out easily but they don’t go back in easily. Take my word for it. Get a pre built 335 harness from RS, Mojotone or Dr. Vintage. Mojotone is the cheapest but they are a little fragile. Dr. Vintage is the most robust but its also the most expensive. All sound good. Remove the stereo VT harness including the VT switch and choke. Put it somewhere safe, like the case pocket. Install the 335 type harness as per the instructions. I suggest putting a dummy switch in the Varitone hole or plugging it with something removable. The ring and chickenhead look pretty cool if you ask me and I would leave them attached to whatever dummy switch you put in there. It could also be a dummy pot or even something functional. Your guitar will still look like a 345, it just won’t sound like one. If you want a stereo guitar but not a Varitone, then you have a very simple option-you can simply disconnect or remove the choke from the circuit and the VT will cease to function. Good mod or bad? You can decide that. I like my 345s to be 345s and my 335s to be 335s. If I could only have one guitar on a desert island (that had electricity and a Fender tweed of some sort-preferably a big loud 2 channel one), I’d go with a 59 or 60 ES-345 but that’s just me. Want to learn more about varitones? Go here. It was written by my friend and resident tech guru, Chris Wargo. If you want to go totally geek, then read this one too. The Best 58-65 ES Value? 62 ES-355 mono Sideways. Thousands less than a 335 and classy as white tie and tails. Sounds pretty much the same too. I’ve written a few posts where I talk about great deals in 335s and their ilk. There was a time when Trini Lopez Standards were a tremendous deal but that seems to have gone away. Funny, at the peak of the market, Trinis were neglected and a nickel hardware 64-65 could be had for around $4000 and a later one for just under $3K. No more. The market caught up and now you can pay $7000 or more for a wide nut Trini. So, what’s the new mary jane? Well, what’s old is new and I think it’s the mono 355. And not because I have a couple to sell either-although in the interest of full disclosure, that is true. 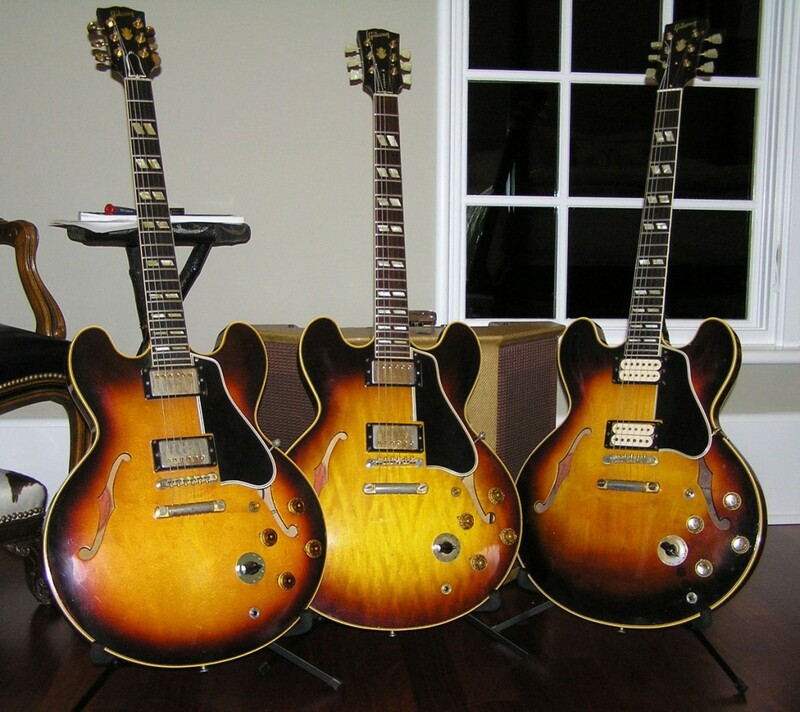 ES-345s and stereo 355s have always lagged well behind the 335 in price both with collectors and players. Folks like to cite the “simplicity of the design” of the 335 and I can buy that, but I think “simplicity” is code for the fact that they don’t like the stereo wiring (too complicated-which it isn’t) and they don’t like the Varitone. We’ve covered the Varitone as nauseam and I’ll leave it alone. I don’t think “simplicity” means single top binding, less fancy headstock and rosewood vs ebony. I do think the trem only configuration is part of the problem, however. 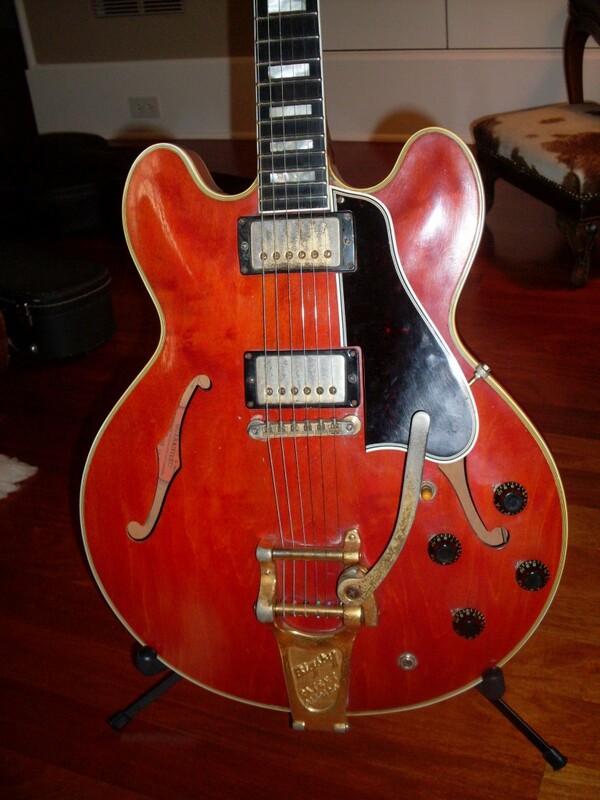 But tell me this….Why is a mono ES-355 worth so much less than a Bigsby equipped ES-335? Let’s look at real sales. I sold a 64 mono 355 for $9000. 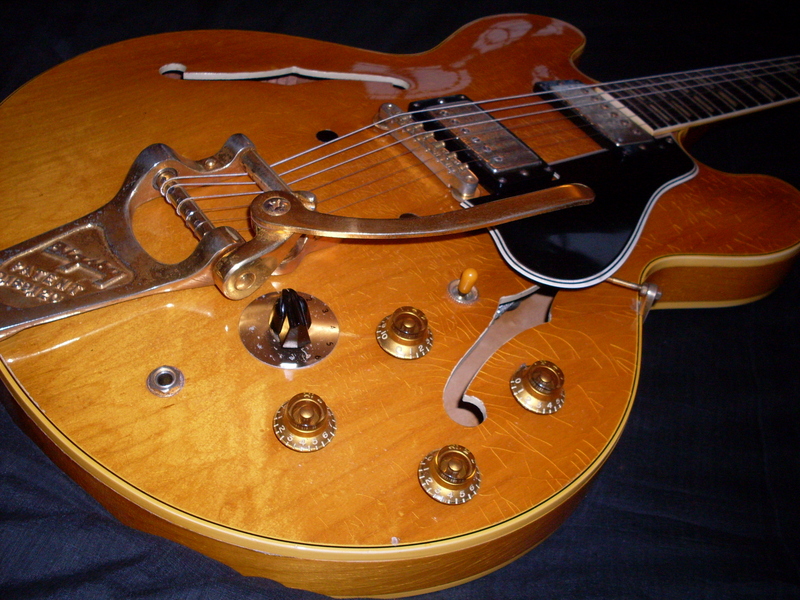 I’ve sold Bigsby 335s for $13,000. I sold a near mint sideways trem 62 mono ES-355 for $12,000. 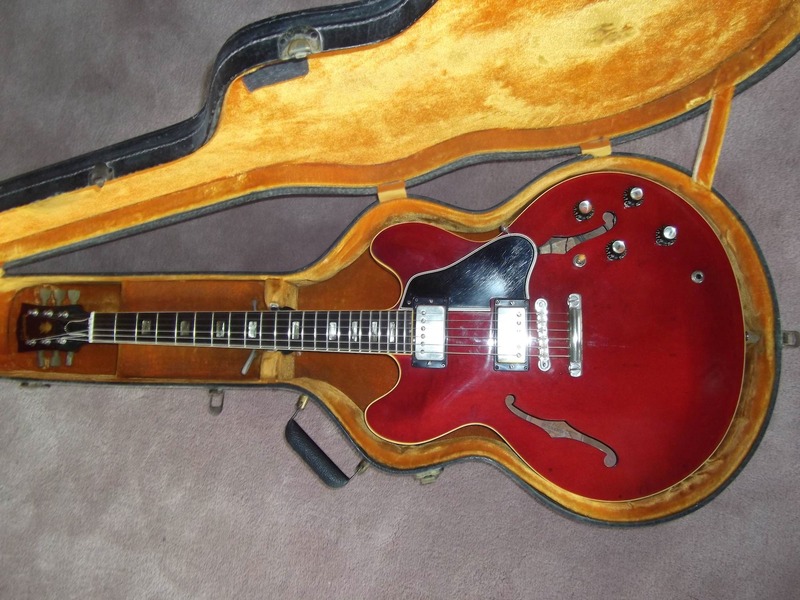 I sold a near mint sideways 62 ES-335 for close to $15K. 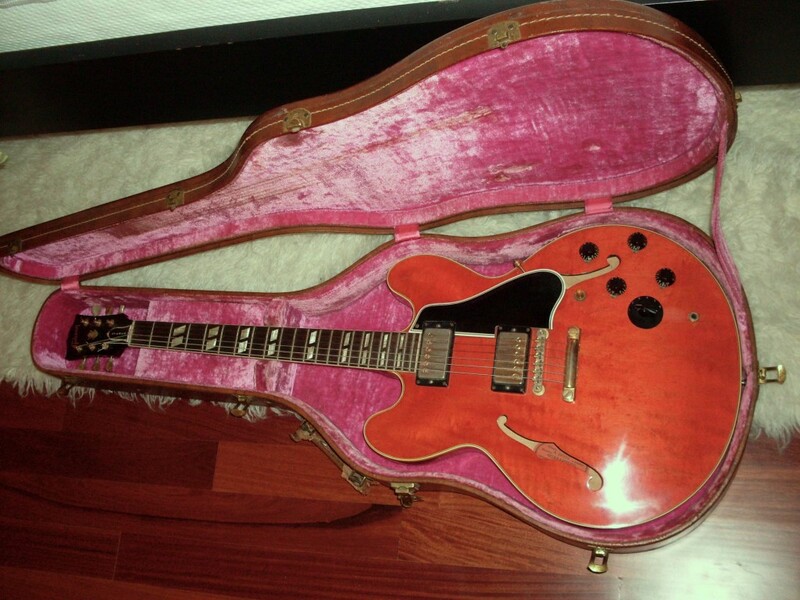 I have a 59 ES-355 mono with a zebra and a double white PAF listed for $15K. The last Bigsby 59 ES-335 with whites or zeebs I had sold for over $25K. So what are you having to endure when you buy a mono 355 instead of a Bigsby 335? Well, you don’t get a “Custom Made” plaque and inserts. Good point. But unless you were going to set the 335 up as a stoptail, who cares. The plaque looks kind of dopey anyway. The ebony board is a substantive difference but I don’t see it as being that big a deal. I like the ebony board because its more durable. You aren’t going to find a lot of divots in the board of a 355. I like the big block markers, I like the 7 ply binding on top and I love red guitars, I don’t mind the bigger fancier headstock and I don’t mind gold hardware. I’d put any 355 mono up against any same year Bigsby or sideways equipped 335-have you close your eyes and tell me which is which. You might feel the ebony and you might, if you have a great set of ears, hear the ebony. You’ll appreciate the Grovers if your 355 has them. You’ll also appreciate the somewhat better wood the 355s often got. One other thing-don’t dismiss the 65 ES-355 mono. There aren’t a whole lot of them but nearly every one I’ve seen has at least a 1 5/8″ nut which is a nice bonus. They also almost always have the really early patent number pickups which are the same as a later PAF. All things being equal, I’d have to say I’ll take a 335 over a 355 mostly because I prefer a stoptail. But if you presented me with a mono stoptail 355 and a same year stoptail 335, I’d be tempted to take the 355. But, given the rarity of a 355 stop, they’d probably be close in value anyway. But if you presented me with a Bigsby 355 along with a couple of grand and a Bigsby 335, I’d take the 355 and the money. Or door number three. No, two. If this late '60 mono 355 was a 335, it would cost you close to $20K. It sure sounds like a 335 and it has the solid center block unlike a 345 or a stereo 355 (and some monos) That also means it has bumblebee or black beauty caps instead of those little ceramic disc things that fit inside the shielding cans on a stereo version. 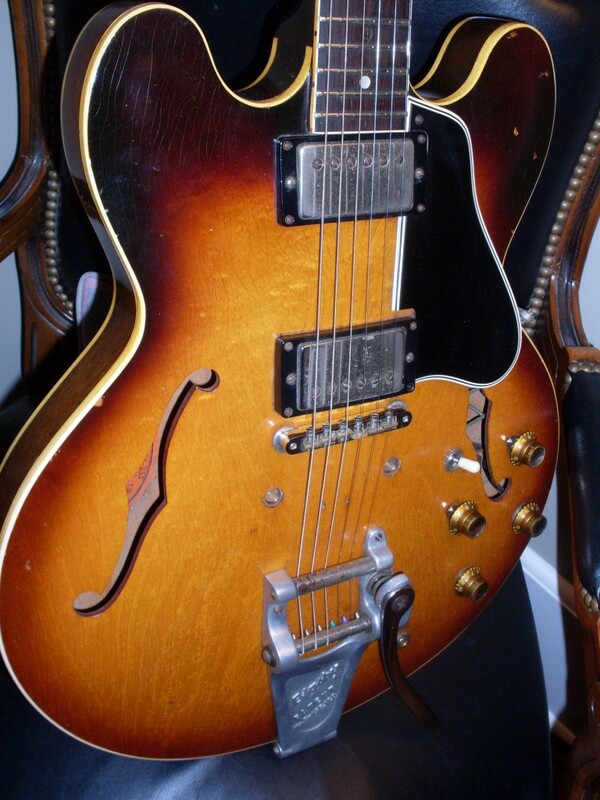 1959 ES-355 mono. Who knew there would be a zebra in the bridge and a double white in the neck? I love an extra added bonus, don't you? It's in the "sweet spot." Early 60 with double whites. It don't get much better than this. Ok maybe a stoptail. as I get the guitar, I check them out. I’ve also learned that there’s a “sweet spot” in the serial number sequence where the white PAFs seem to congregate. It certainly isn’t foolproof but, in general, I know when to expect a white or zebra and when to expect a black-at least with the nickel covered ones. With the gold ones, all bets are off. In the past 2 months, I’ve acquired around 12 ES guitars with PAFs from 1959-1961. An astonishing 6 of them have had at least one white or zebra PAF. Let’s look at the serial numbers of the whites and zeebs I’ve found in the past couple of years. The nickel ones had serial numbers in the A306xx-A309xx range. that’s a pair of zebras and 2 pairs of whites. The gold ones show a wider range -the earliest gold covered whites or zebras I found were a zebra and a white in A306xx and another zebra in 309xx and a pair of zebras also at 309xx (2 numbers away). Two late 59 ES-345s both at serial A321xx had whites and the blonde ES-345 I bought had whites and was serial number A323xx which is an early 60. Then, I found another pair of zebras in (gasp) a 61 ES 355. Serial was not even an “A” serial but a four digit numbers only type. So, perhaps the “gold sweet spot” is less a spot than a blob. But there is a pretty big contingent of them at A321xx-A323xx. As players and enthusiasts, we care about tone and playability, so why would anyone pay an additional few thousand dollars (EACH) for white bobbins as opposed to black ones? I look at it something like this: There’s a scene in the Broadway version of “Kiss of the Spider Woman” (and maybe the movie too, although I couldn’t sit through it) where the window dresser character insists that the mannequin in his window had to have a Balenciaga scarf in her handbag. You couldn’t see it but he would know it was there and it was vital to his design (and comfort) that it be there. Because “she would have one”. I think whites and zebras are a little like that. You can’t see them under the covers but isn’t it nice to know they’re under there? As an aside, none of this applies to Les Paul guys who wear their Balenciagas, I mean their white PAFs, without covers for all to see. Showoffs. Two of these have double whites. One of them is, uh, the refinned one on the right. That looks cool but it also looks wrong. Leave the covers on. Isn't it enough that you know there's a white under there? The area in the black mark is a delamination-the plywood is coming apart. It looks like a bubble under the wood. Generally the problem is cosmetic and not worth losing sleep over unless it keeps getting worse. OK, the title is a little misleading-you should look for a guitar you love the sound of and that is comfortable to play. I’m going to talk about things to look for that might (but perhaps shouldn’t) keep you from buying that guitar. I’m talking about the things that can be wrong (or go wrong) with these guitars. Every guitar has strong points and weak points. Les Pauls can be overly heavy, SGs have weak neck joins, Firebirds can be neck heavy and on and on. One of the reasons I like 335s and their brethren so much is that they don’t have a lot of weak points. There are things to look for however. 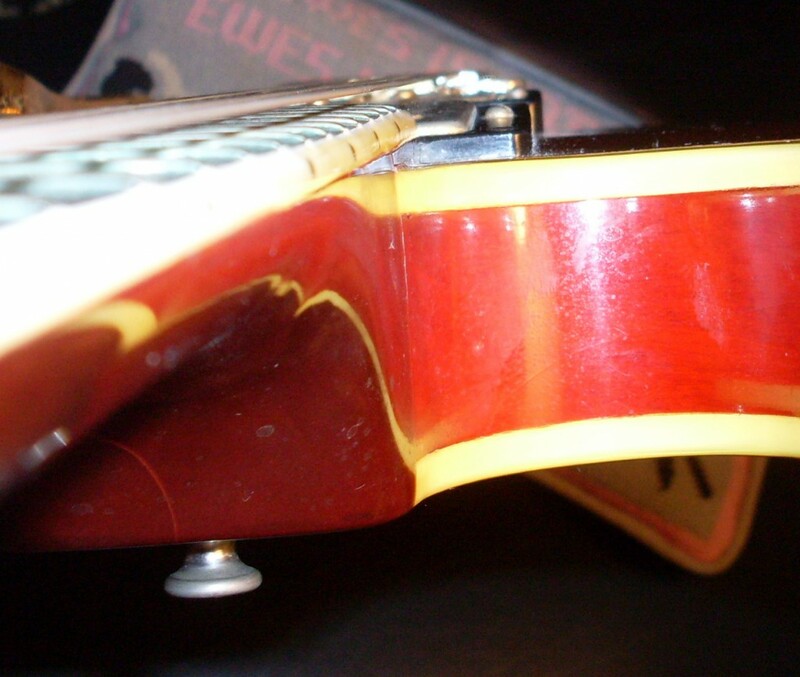 The weakest point actually is more Gibson related than specific to ES’s and that is the ABR-1 bridge. Nothing will sink your tone faster than worn or over notched saddles or a collapsed bridge. The good news is that its a really easy fix. To check an ABR-1 to see if it has collapsed, remove the saddles and turn in upside down on a flat surface, If there’s any space between the top of the bridge and the flat surface, it’s collapsed. Get a new one or replacement. If the strings are more than halfway under the top of the saddles, get new saddles or file down the tops of the saddles until that is no longer the case. The weakest point on just about any Gibson guitar is the headstock. Think it’s easy to spot a crack? Well, usually it’s pretty obvious but don’t take anybody’s word for it. Get out a magnifying glass and a blacklight if you have one. 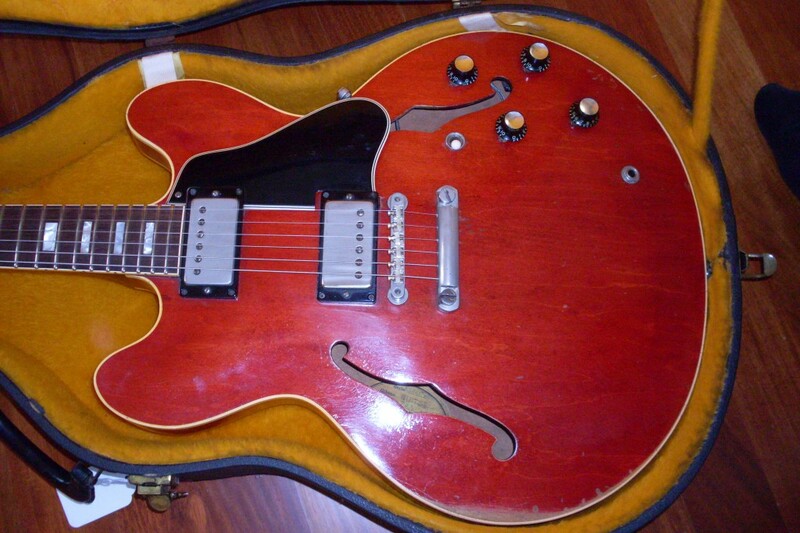 I know of a 63 that was sold at auction recently to a dealer who has more experience with 335’s than I do. He had it for weeks before finding the crack and may never have found it had he not been tipped off by another expert who noticed it at the auction and told me about it. Next, take a look down the fingerboard. There are a lot of dips and rises that can be adjusted out with the truss but there is one that is common that can’t be. ES’s seem to be prone to a slight rise at the area where the fingerboard meets the body. That’s an area in which most of us don’t play much and it may make no difference at all for you but you should be aware of it. The fix for this is pretty easy as well-a fret level will usually take care of the problem-the rise will still be there but as long as the frets are level, it won’t adversely affect playability. Another weak point is the ground wire on a stoptail version. The ground wire is an uninsulated single heavy gauge strand of wire than goes from the stoptail bushing through the center block and attaches to the braid on the neck pickup lead. What often happens is that when the harness is pulled for any reason, the wire gets broken. It’s kind of brittle and doesn’t improve with age. If it breaks at the pickup end, its no big deal but if you break it off at the stud end, it is a somewhat involved process to replace it-often requiring the removal of the stud bushing-something best left to a repair shop. You could run a thin wire from the pickup lead to the bridge post under the pickguard and it will work fine but it won’t be correct and you’ll see it if you look closely. The last thing to look for are cracks and delamination in the top or back. It’s no secret that ES’s are made of plywood and plywood is held together with glue and glue can give up over time. A delamination will usually be raised and will look like a “bubble” in the wood. You can sometimes move the wood by pushing down on it as there is usually air beneath it where the glue gave way (or never existed). There is also often a crack at the delamination point. Don’t confuse finish checks for cracks in the wood. It’s easy to do so. A check usually can’t be felt with a fingernail, although that isn’t always true. If the line appears to go beneath the finish to the wood (and follows the grain), it’s probably a crack. There is good news here as well. Because cracks and delaminations generally only affect the top ply, they are neither structural nor do they affect tone. They don’t look that great but they shouldn’t deter you from buying if you like the guitar. Just be aware that they will diminish the value somewhat-not unlike a major ding or scrape. Note the last few frets (and the binding) are going slightly uphill. This is pretty common and not too hard to fix as long as it isn't to severe.. It requires a fret level.